Detail plates are attached with standard phillips head screws, making it easy to remove a blank plate to have your next champ's info engraved! See our FAQ for information regarding having future detail plates engraved. We also have a smaller version of this award! NEW! Our Black Marble Finish Stand Up Plaques are wonderful, affordable traveling awards. Made of wood, not cheap plastic, this award is surprisingly sturdy. 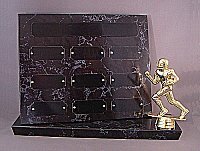 These awards feature high-quality black brass plates for your league name (on the title plate toward the top) and yearly winners (on the smaller detail plates). We are confident that you and your league will find this award meets the high quality standards you've come to expect from Affordable Trophies. Click on the image to see a larger picture of the award.